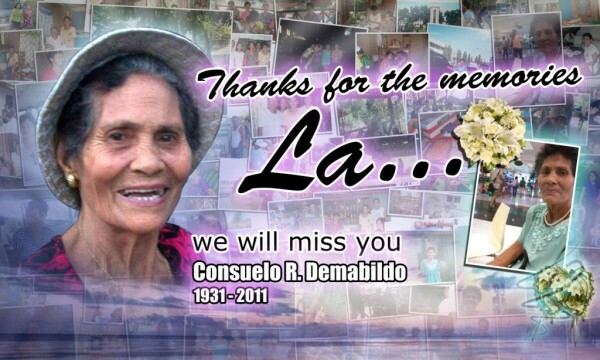 Late in the afternoon today, I attended the funeral service of my wife's aunt, Consuelo R. Demabildo, 80. As I observed, aunt Consoleng's eldest daughter, Marlyn who was about to give words of thanks to those who condoled and sympathized with them, couldn't utter a word. She just kept on sobbing. Why? What kept her mouth unable to express things? Is it because her beloved mother had left them? Whatever? I remember four years ago that I gave a message on death at the funeral service of the late Gary Baradas at the meetinghouse of The Church of Jesus Christ of Latter-day Saints in Barangay Aljis, Bacolod City. My central point of my message was focused on the Biblical scripture: "In Adam, we die. In Christ, we live." Because of the transgression they had made at the Garden of Eden, Adam and Eve were driven away from the presence of God. That’s the beginning of the first death, the spiritual death. Man, therefore, by nature is an enemy to God, his Creator. He became carnal and subjected to the laws and commandments of God. When death comes, is it necessary to be happy? Or to be sorrowful? Or more so to be afraid of? Since Adam’s transgression, we all come short of the glory of God and because of the carelessness, negligence, hardheadedness to heed the God’s words and obey His commandments some of us pass away untimely. But we know pretty well that in Christ, we live. It is His atoning sacrifice that has redeemed us from our sins. Unless we persist on committing those sins, we will not live with Him. So nothing to worry, nothing to be grudged with, and nothing to fear, when death comes. We have all the chances and the hope to be resurrected, and be reunited with our Father in heaven, our Creator, and more importantly to be with our departed loved ones when the proper time comes!